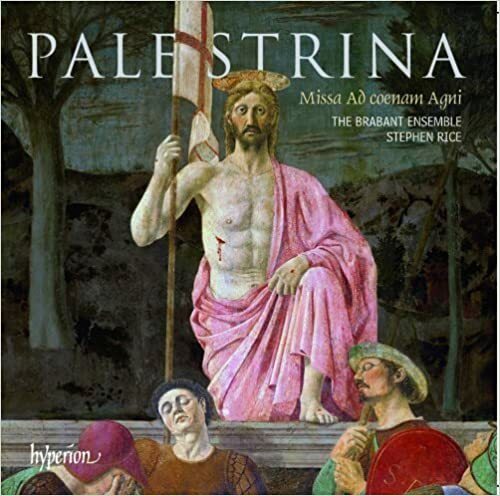 The Brabant Ensemble is back, this time with the famous Palestrina, but keeping with their mission to give us unrecorded or rarely-recorded material, this new disc features the Missa Ad coenam Agni providi. NOTE: All of the music on this program is from the recent release of Palestrina from The Brabant Ensemble directed by Stephen Rice. The recording is on the Hyperion label and is number CDA67978. 'Eastertide offertories, antiphons and motets from the master of Renaissance counterpoint. The spirited Surrexit pastor bonus, its accompanying antiphon Regina caeli and the gradual Haec dies are sung with a full-voiced, beefy intensity that lifts the music away from mere polite polyphony and gives it a really exciting energy'.